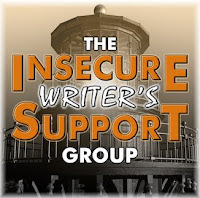 It's the first Wednesday of the month and time for all Insecure Writers’ Support Group members to answer the monthly question posed to us--or write about whatever else is on our mind. If you are a writer and have any insecurities about your writing, this is a fantastic group. Come join us. At fifteen years of age, I felt I had found my niche in life. Journalism was in my blood. I joined the school paper, and the words seemed to flow naturally from my pen. My English teacher encouraged my writing and even submitted one of my fictional manuscripts, a short story about a teenage girl contemplating suicide, for competition. It placed second. I was thrilled, at least until my mother read the story. Then my budding career came to an abrupt halt. Convinced that I was the girl in my story, Mother watched me for signs that I might attempt to kill myself. She hid the prescription medicine, bought an electric razor, and suggested that I shower instead of bathe. She would even creep into my room late at night to make sure I was still breathing. After a while, the family furor died down, but I was left with insecurity about allowing anyone close to me read my work. My constant self-censorship significantly hampered my creativity. I finally confided my problem to my English teacher, and he told me a lot of authors felt the way I did. He suggested I assume a pseudonym, on the premise that what my mother didn't know wouldn't hurt her. He assured me that many great writers did this and pointed to Mark Twain as an example. I silently wondered if Mr. Clemens had also had a problem with his mother. I took his advice, and things went well for about a year. Then an article I had written for the school paper on drug abuse was reprinted in the local paper. What was worse, they printed my real name! It was right there in black and white for God and the world, and my mother to see! Needless to say, Mother was convinced my information had been obtained first hand. Using a fictitious name, she took me to a doctor (in another town, of course) for counseling. He assured her that, considering the state of the world in the mid-sixties, I was within the range of normalcy for a sixteen-year-old and was not on drugs. Mother wasn't convinced, and once again I suffered through weeks of covert surveillance as she searched for signs of a drug overdose. One day we bought a new computer for the office. I installed it and to check out the word processing capabilities, I typed a short anecdote about a paranoid computer and let it fly across the Internet. The phones came alive as coworkers and friends intercepted my tale. Everyone loved it, and I was hooked--again! I wrote a short story and dropped it in the mail. It was accepted, published, and I promptly received a check for my work. After all, this time, dare I believe I still had the knack? To prove to myself that my first publication in nearly thirty years wasn’t just a fluke, I took keyboard in hand and pounded out another story. Once again, my work was published. I was on a roll! Mother traveled across three states, arrived at the front door with a suitcase in hand and announced that she had just dropped by to see how we were doing. Mother stayed a week, and for perhaps the first time in our lives we actually talked. After all those years of tension and resentment, we finally reached an understanding. Mother agreed to accept that I was a fictional writer and my stories could possibly be the product of a very active imagination. In turn, I assured her I would always use a pen name when I wrote anything that might shock Aunt Mary or the Reverend Brown. Elated that I had finally removed the major stumbling block to a successful writing career, I put Mother on the bus for home. I've always loved this story! You would've been a great journalist. It's not too late. I'm sure you can write about your upcoming adventures for a retirement magazine.